Britain is about to warm up as balmy tropical winds and glorious sunshine trigger a return to spring in time for the bank holiday. Early long-range forecasts suggest better weather may hold out through the rest of this month and into May. Temperatures will rocket from Monday with much of the country likely to be basking in warmth by the end of next week. It will follow a chilly few days when bitter easterly winds will push temperatures widely below freezing bringing widespread frosts and the risk of wintry showers. High pressure responsible for the cold weather will shift after the weekend allowing milder air to flood in from the Continent. Temperatures are forecast to lift back into double figures with some models showing a chance of 24C (75F) by Easter Monday. 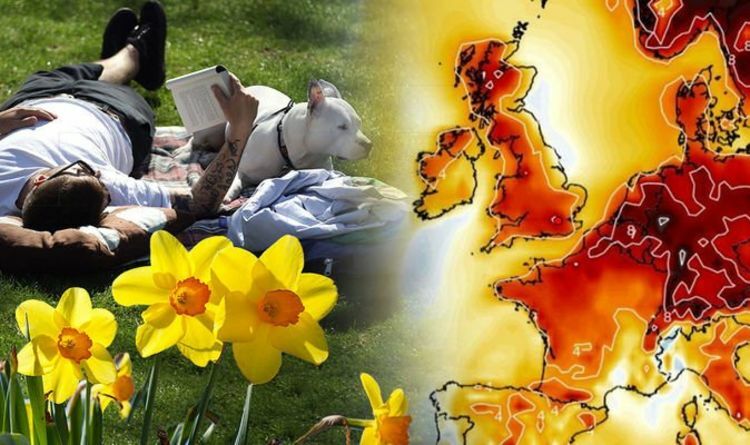 Unusually Scotland and northern England are most likely to enjoy the higher temperatures although the mercury will hit double figures widely. Met Office meteorologist Luke Miall said a change to warmer and largely more settled weather will set in after the weekend. He said: “Things will start to feel a lot more spring-like and temperatures will rise into the mid teens. “Southwestern areas will turn a bit more unsettled and southern areas could see more in the way of wet weather with some heavy rain likely to come into the southwest. “Warmer air next week will come in from the Continent. High pressure currently positioned over the UK and Scandinavia is driving a flow of bitter air in from the northeast pushing temperatures below average for the time of year. This high is forecast to shift through the weekend and start of next week allowing milder air in from the Continent and the Atlantic. The only hitch will be that southern parts of the UK will see more in the way of wind and rain before the whole country turns more settled. Early signals point towards a warm and sunny Easter weekend with long-range forecasters hinting at warmer, more settled conditions holding out through the rest of spring. Exacta Weather forecaster James Madden said: “So far this spring we have seen some very changeable and at times unseasonable weather and this is set to continue for the next week. “However there is higher confidence for some much warmer and settled conditions building later this month and into the start of May. Weather charts show high pressure moving further to the northeast away from the UK through the start of next week allowing a more southerly flow of air into the country. Warm winds will sweep in from the Continent across north Africa and southern Italy and into Britain, according to global models. The mercury will widely reach the high teens next weekend and through the bank holiday with some parts possibly touching 24C (75F). However weather models are still unsure of the Easter weekend picture with some predicting clear skies and sunshine while others warn of wetter conditions, some experts warn. AccuWeather's Eric Leister said while it will feel warmer compared to the start of the month it could still go either way when it comes to rain. He said: “A very complex weather pattern is set to unfold across Europe over the next two weeks meaning the forecast for the big holiday weekend may take several twists and turns. “The weather will likely come down to two primary factors, a Scandinavian high pressure system and a cut-off low pressure system that will be located somewhere in western Europe. “My current inclination is to favour a stronger Scandinavian high pressure which could act to shield the UK from wet weather. A spokesman for The Weather Company added: “Temperatures will slowly return to the seasonal average, perhaps even becoming warm in the south and southeast, to welcome the forthcoming Easter holiday, according to some computer models.